what would YOU do for the mount and glass? Optics on AKs is such a hard thing to get right. You buy some pricy mount, don't like it, sell it, buy something else, repeat, repeat, and so on. I gave up pretty quick with my Vepr .308, but part of that was likely because my .308 friends had other rifles that would really shoot and were easy to find adequate mounts for (AR10, and Savage Model 10). I am still waiting for that AK scope mount that does good glass some justice. If you happen to find that end-all-be-all scope mount for AK that doesn't work against consistency, please let me know what it is. I don't have the money nor the time to figure that one out, lol. No clue what your desired budget would be on some glass, but I am liking the Primary Arms stuff. For the price, this scope is wonderful and the ACSS reticle, which was inspired by the older Russian stuff, is extremely handy, but eye relief is likely too short for a true scout setup. They have a much higher end 1-8x with the ACSS reticle for about $1300 and I can't even imagine how great that one must be. By any chance, does Ultimax make a top handguard replacement with a rail on it for the AK's? I have one for an M1 Carbine and it works pretty well for me. They do. There is that one and a few rear sight location mounts from other companies that may work for a true scout setup. This reviews well and has 9-12" eye relief. Not too bad on the wallet. For a little history, Burris apparently invented the scout scope. Is it impressive for that price range? It works well for me, but I don't have any long distance ranges to work with. Good old thread bumped and good. Do you still have that factory left side receiver scope mount rail? If sosss, some outfits still make a scope mount that attaches to such. Be sure to get one tall enough so the top cover can just come off and on without bothering the scope or mount. If mounted as such you may have to shim the side receiver mount. We had to. Both up and down and side to side. Just drill out the rivets and shim, then use short bolts and Locktite. Fun. Easy. Usually a Leopold 1x4x20 scope is used. We have NOT shot THAT Saiga for a long time. He wants a scout mount. Thank you. My old eyes just skipped over that part of his first post. I was attracted to and read the recent post by Ronin38. Has he considered the heat potential? Most optics mounted over the hottest part of the gun do not do well under multiple fast mag dumps. Just thinking out loud here. It is an AK. Zombies come to mind. In SW OR USA it is tweakers. I wouldn't pursue it, unless you think that you would shoot it more. If you do it, I would put a heavy thumb-stock on the back too (more stable repeated shots). I have never been happy with glass on guns or airguns. I have absolutely never been satisfied with the performance of an AK based weapon with an optic. I don't know if it is just the platform or the mounts, or a combo of the two. I have only tried with a few guns and decided that it was so far from warranting the optic being on there that I was just better off with irons. I don't have to time or the extra money to be trying everything until I find something that is adequate. My AR does so well with an optic on it that it is hard to see past just using that. 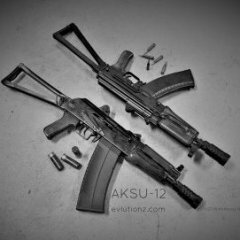 Anyone who can get what you want out of an optic equipped AK, cherish it as it has been unattainable for me. I don't know your budget, but I would go with a midwest industries or RS regulate side mount and something from Nikon with low starting power, some zoom, and most importantly a large field of view. I've been really impressed with several of their scopes in the $150-$350 price range. I think I would prefer a mil dot or similar stadia system to a BDC, but I would probably be happier with either. I'd love the ACSS reticle in an illuminated scope. I know he's looking at scout scopes, but I hate the scout scope mounting setup. If you are thinking about a scout scope, just get one of those primary arms dealies with the acss reticle and put it on an ultimak type mount. Evl might not be satisfied with his experiments with glass on Ak but people perform better with glass than without, end of story. I am confident that just about anyone shooting with a red dot will shoot better than that same person shooting with irons, including Evl. Maybe not as much better as he might want, but still better.